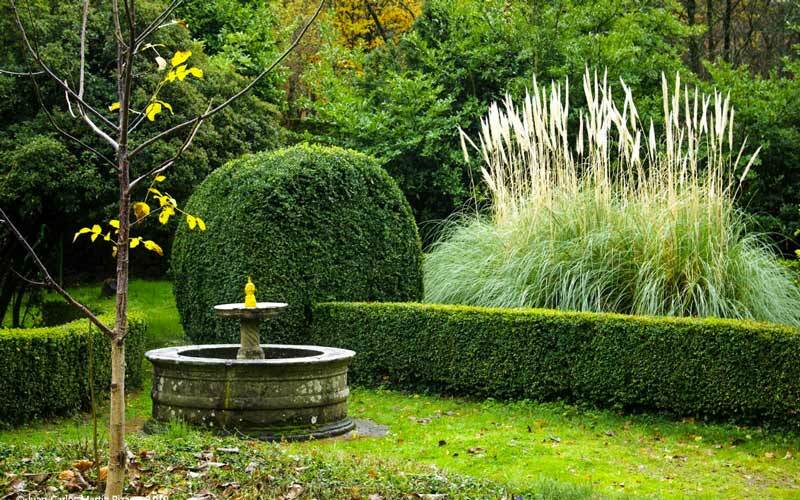 We are starting a tour of series of gardens of which “the selection criterion – of course very subjective – has been that they were spaces with their own soul and that they were open to the public”, according to the author of the texts, Anneli Bojstad. We are starting with The Forest of Béjar (Salamanca), an authentic garden jewel that reaches its splendor in autumn. “I have come to my villa not to cultivate the fields, but the soul,” wrote Cósimo di Médici in 1462 when referring to his recreational estate in the vicinity of Florence. The Forest of Béjar, created in 1567 by the second Duke of the locality, Francisco de Zúñiga y Sotomayor, is of Spanish offspring. It is a Renaissance villa conceived for the contemplation and the enjoyment of the rural life. Even today, this exceptional ensemble, which includes a palace, gardens, orchards, meadows and forest, preserves the essence of the Italian humanist gardens, inspired in turn by the Roman villages described by classical authors such as Cicero and Pliny the Younger in their letters. True to the writings made by the architect Alberti in his emblematic work “De re aedifi catoria,” the village stood on a hillside near the city (the forest is only one kilometer from the center of Béjar) and a close proximity was kept between the building and the garden, arranged in terraces decorated with architectural and decorative elements: stairways, fountains, banks, squares, and more…These elements, now covered in lichens and accompanied by old plantains and chestnuts, are vestiges of the exquisiteness of the original design. But if the classicist layout of the garden invokes Renaissance Italy, the huge pond, located at the foot of the house and a true place of beauty in the Forest of Béjar, evokes feelings of similarity to even more remote places. With an island in the center – which currently has a romantic gazebo from the late nineteenth century – it is similar to the the great Mughal Gardens of northern India and Pakistan, with its floating pavilions amid gigantic water extensions, such as the famous Lake Palace in Udaipur. It is likely this eastern influence came through Portugal, the first European country with presence in India since the arrival of Vasco da Gama in 1498, because in our neighboring country we find similar pond structures with pavilions. For example, the beautiful gardens of the Quinta das Torres. 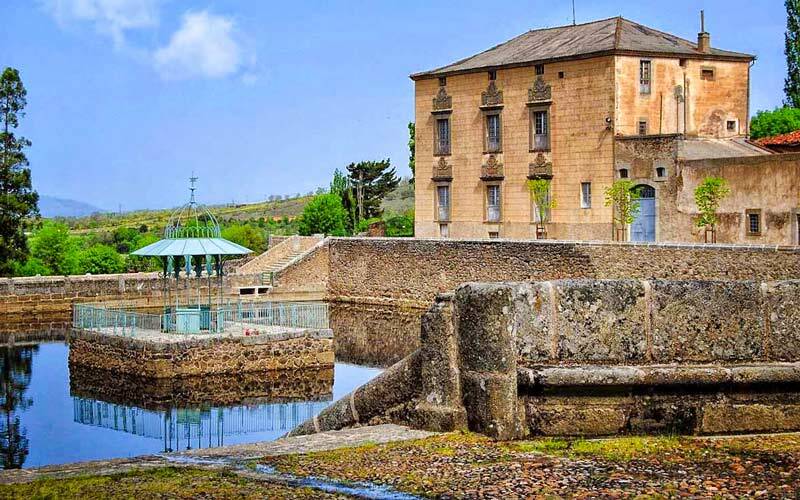 It is the richness of the water – thanks to an abundant spring that is found in the nearby mountain range of Candelaria – which makes possible the whole of the Forest of Béjar, with its many aquatic elements, its generous orchard and its lush oak and chestnut forest. Here we find a delicate symbiosis between the natural landscape and the cultural landscape. If we continue our journey through the forest, coming down from the pond to a lower terrace we find a romantic garden, which feels as though it belongs to other times. In 1869, the last Duke of Béjar, Mariano Téllez Girón, sold the property. The new owners changed the original geometric structure to another very fashionable style at the time, with sinuous paths and exotic conifers, Sequoias, Spruce, Pinsapos, as well as a magnificent specimen of Magnolia grandiflora. On a lower level, the orchard is spread out, populated with fruit trees and irrigated by ditches with the waters of the big pond, which serves as a water tank. Below, the water is collected in another pond, that serves as a reserve. This brings together the practical and the aesthetic in a unique setting, which despite several modifications, retains its original disposition. Since 1996 the Forest of Béjar has been owned by the municipality. The mountain range of the ‘Sistema Central,’ green and granitic, which separates the two castiles, becomes a haven of serenity with echoes of Oriental tales.